A large part of the reason that it was so difficult is that the original owner is deceased and took his secret recipe with him. Justin was able to track down the descendants and working with them, was able to bring back the flavor they know and love. 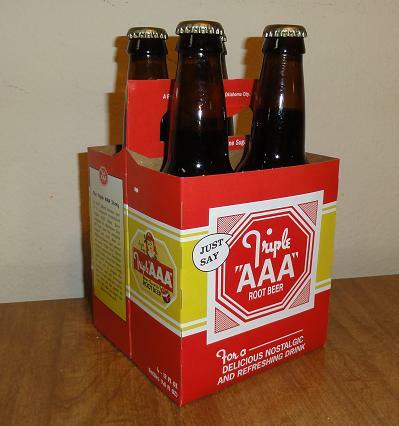 As for now, Triple AAA Root Beer is only available at the Bricktwon Candy Co. but Justin hopes to expand in the future. Here’s wishing him the best of luck with his root beer endeavor. I picked up a bottle of this at Pop’s on Route 66 and I’m glad they brought it back. Sadly another Oklahoma original root beer is in danger of being lost if somebody does not try and rescue the recipe for Coit’s root beer since they closed all of their locations. no, it was draft only. That’s the problem with these homemade root beer stands that were family owned and then close down. The recipe stays with them. There are, however, family members still alive I believe so one would assume they still have the recipe but I would not know how to contact them. There is info about the history and closing of the restaurants on the web which is pretty interesting. This root beer is a knockoff. Not the original formula.